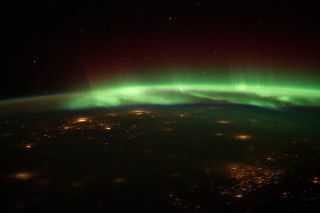 The aurora borealis steals the scene in this nighttime photograph shot from the International Space Station as the orbital outpost flew over the Midwest on Jan. 25, 2012. Cloud cover makes it difficult to identify the cities that are within the captured area. The spacecraft was above south-central Nebraska when the photo was taken. Astronauts aboard the International Space Station are on a quest to snap photos of the northern lights so the public can better appreciate this spectacular cosmic display. The space station crew has already beamed home dazzling photos and videos of Earth's auroras, including a series of movies released by NASA last week. Now, the astronauts are teaming up with Canadian scientists on Earth in a coordinated campaign to track the northern aurora displays. Throughout February and March, NASA astronauts Don Pettit and Dan Burbank will be on the lookout for flare-ups of the northern lights, also known as the aurora borealis, over Canada. The spaceflyers will beam their pictures and videos back to Earth for the public to see within 48 hours. The footage snapped from 240 miles (386 kilometers) above the Earth is complemented by aurora imagery captured and webcast in real time from Yellowknife, a city in Canada's Northwest Territories. It's all part of an effort called AuroraMAX, a public engagement initiative that aims to show people the beauty of the northern lights and highlight the science behind the phenomenon. AuroraMAX is a collaboration among the University of Calgary, the city of Yellowknife, Astronomy North and the Canadian Space Agency. Auroras result when charged particles from the sun collide with Earth's atmosphere, generating a glow. These particles are funneled over the poles along Earth's magnetic field lines, causing the northern lights in the Northern Hemisphere and the southern lights, or aurora australis, in the South. The auroras are often supercharged by massive eruptions on the sun known as coronal mass ejections. These storms blast huge clouds of solar plasma into space at speeds of 3 million mph (5 million kph) or more. If the eruption is aimed at Earth, skywatchers at high latitudes can be treated to quite a show when the particles arrive a day or two later. Dazzling aurora displays should be on the rise over the next few years. The sun is currently in the middle of an active phase in its 11-year solar weather cycle. The current sun storm cycle, called Solar Cycle 24, is expected to peak in 2013, NASA scientists have said.